Just checking in Dave , nice to see you have a project in the works , I'll be watching for sure !! 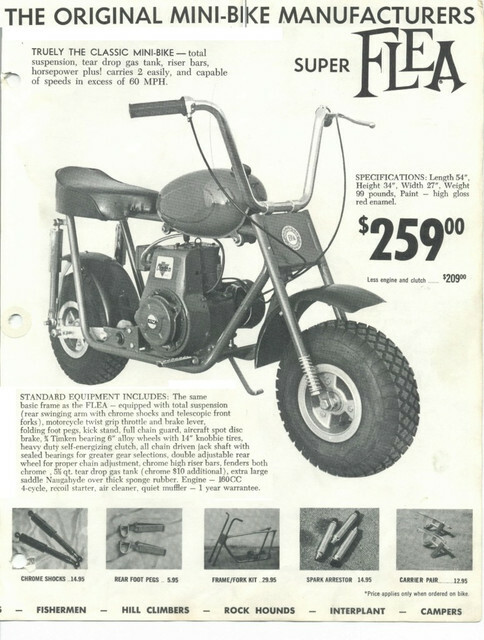 starting to wonder if the stickers for the minibikes where just like the bugs(blue and black) ,but only with the word flea in the center. note also they came in 2.5 and 3inch decals for the karts. 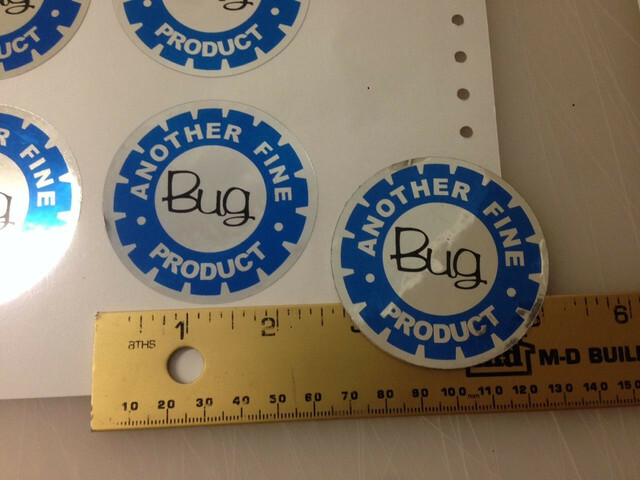 these decals are still on ebay for sale. 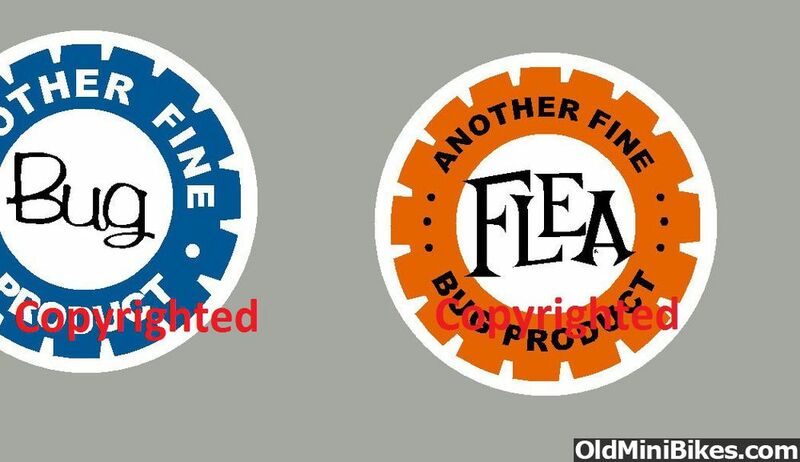 I would bet he would make them with the word flea in the center. just got to figure out if they are 2.5 or 3 inch ? there is couple give aways a guy could figure that out I would think. the width of the tubing on the forks? decal also appears to be bigger then the decal on the engine(Clinton) guy could measure the height/width and compare? [MENTION=339]delray[/MENTION] thanks for that. I have contacted the seller and enquired. Two inches seemed like if filled up the space from a perspective of ratios. (It's early) 2.5 may work. I'll post the results here. Delray, thanks for the heads up. The guy did a beautiful job replicating the logo. This is intellectual property, and owned by the individual above. so what was the correct color? the orange back ground then? did peeweepinstriping know the correct color for the bikes? nice dave,that was quick...…...:thumbsup: so what was the correct color? the orange back ground then? I had him fashion it after the logo in their brochure. I'm getting two decals, and the remaining one has your name on it if you want it. 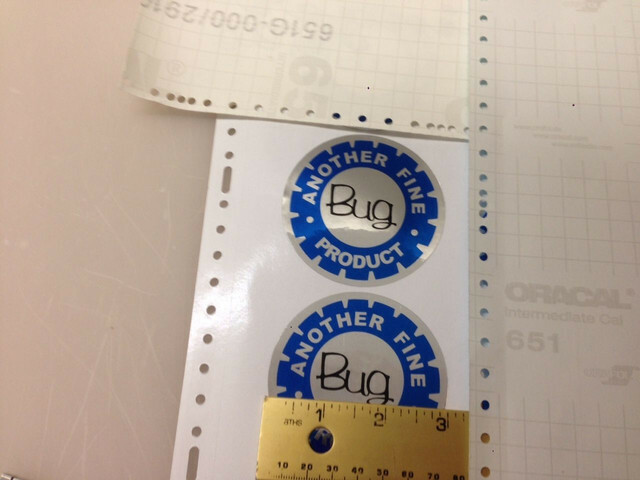 Note, he is printing them on foil background as you pointed out based on your remnants. So yes Brian, the orange was the original color! It's my story and I am sticking to it. Any other color would be arbitrary, unless someone can catch "Lady Bug" Faye Pierson at an event and ask her if she remembers! As far as color, mine was "high gloss blue enamel." Beneath several layers of paint, I found it. There was a metallic component to it. So I will be duplicating that paint in an acrylic enamel. I'll start by finding production automobiles from 1970 to 1973 and looking at codes. That usually gets me in the ball park. Your bike with the integral bars, might have been the "Spanish Flea" which sported high gloss red enamel paint. Update on the tires: I got them from "Web Bike" on line. I opted for the cheap shipping from Japan. Web bike shipped and provided me a link to track the shipping, translated into English. I received the tires from my regular mail man two weeks after I ordered them. Highly recommend Web Bike, if OMB Warehouse, or local vendors can not meet your needs. One of three projects I am doing, so I am slow. Here are the Bonanza bars I got from Manny. Looks just like the brochure. They're mounted with those frame clamp mounts we generally see used for foot pegs. From the brochures, that is what it looked like they used. You can see the foot pegs mounted at the bottom of the frame. White plastic corner fill tank from Joe51 is mounted on the late model H35 I'll be using. I'm not currently inclined towards going with a proper era H35 or 404 Clinton. Those bars do look like the brochure. :laugh: Your making progress. Looks like the grinder needs a work out to take care of a few welds. :laugh: Good job on the handle bar mounts. Yep, I had to replace the entire right side of the forks. Had some welding issues. Nothing new there. I need to remember to grind stuff and arrange lighting better before posting. Not. The bike came with a kick stand welded on to the bottom of the engine plate. It was pretty nasty, but on a whim I cut it out, took it apart and got it looking better. The stand portion was pretty bad, bent up, and out of shape. I never did find out what stand is "supposed" to be in the bike. I had dismantled a "Cat" stand last week that I am using on another project. For the Cat stand, I fabricated a longer stand portion, drilled the hole, made the slots, worked great. I saved the shorter piece, and surprisingly, it fit and worked great on this one. :thumbsup: Dave.... I've enjoyed all your posts on this restoration. Looks like you had a few hurdles to overcome and the results are just Awesome. I can hardly wait to see it after replating some parts and getting the paint finished. Have you decided on an engine yet? I'm hoping you divert from Original and go modern now.. You have a very good frame set that can do the speed and your Tires/Wheels can do the deed so I'm looking forward to probably one of the best Fleas ever finished. Go the distance Dave!!! Good Luck.... Love your project! Howdy Weav, I am hardly deserving of your nice words. I've backed off on this project as I am working on another one of mine, as well as a project for another individual. Thanks for the kind words. I've never contemplated using a modern engine on a vintage bike. LOL, but "Bug" did say this baby was good to go for over 100 MPH. 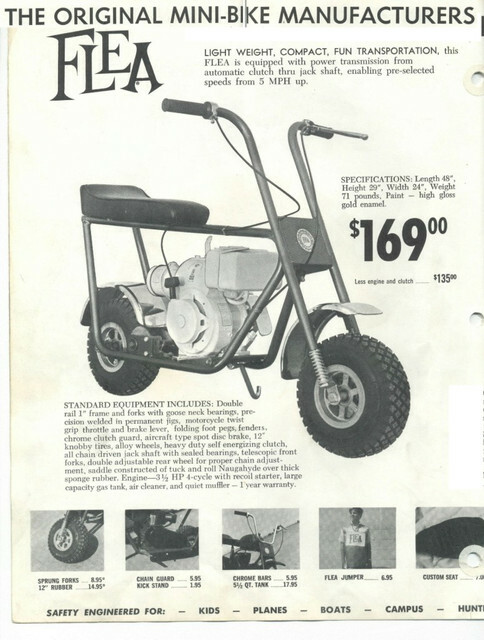 I was contemplating newer 3.5 flat head engine for it, dressed up like an earlier model. Dave, I don't doubt you are working on more than one thing at a time and that makes the work completed on the Flea that much more cool. Lots of good experience... And it was the 100 mph comment that got my attention. I want to learn a bit more about the geometry of that setup and how it truly rides once it's completed. That's why I'll keep lobbying for a more modern engine.... LOL... Otherwise, I totally respect your thoughts on using a more "Period Correct" setup.... Above all, Have Fun! In between the in betweens, (See the film "Hard Times" 1975) I have been dabbling on this Flea. I ended up making two additional disc brake rotors. One of them is on this bike. I got this newer H35 running. I got it with some other stuff from our pal in Utah, and cleaned some gunk off of it and rebuilt the original carburetor. It runs very well. I don't generally use these modern engines, but what's not to like? A bit low geared like this, but I like it. Green spring clutch I rebuilt from an internet cheapie. I don't have much money in this bike. Just the wheels and tires. There was a lot of fabrication I did earlier, and all of that stuff worked, and I don't know, I'll paint this thing, but it could be cool just rattle can painted. It's nice to have 'em running, even if they aren't done. It needs a seat. 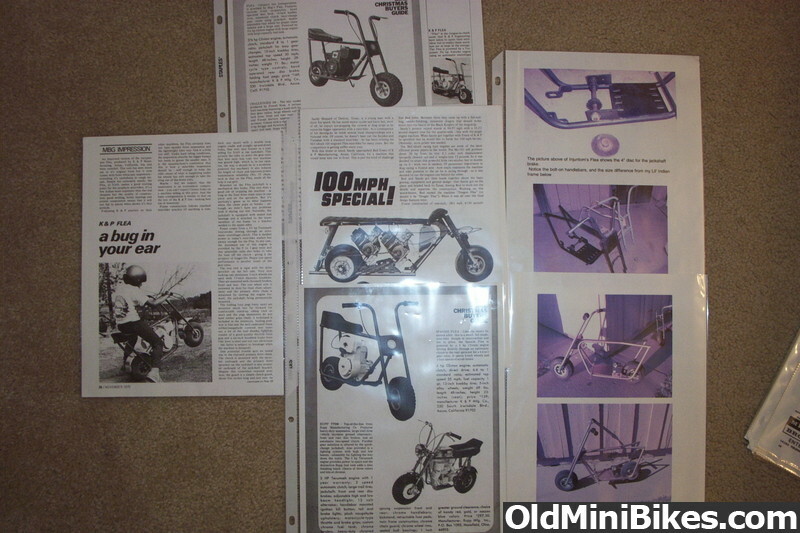 Nice I stared at that motor for years after I took it off a manco go cart. Good to see it being used!